No matter what the last few years of hype might have told us, bringing Star Wars back was always a risky move. It might seem like our current nostalgia-based pop culture consciousness will turn anything new that happens to be based on something familiar into an instant smash. But there’s always the chance that audiences might rebel, upset with the way their beloved stories have been altered, or fans and casual viewers might split, leading to endless debates over the “true” nature of the franchise. 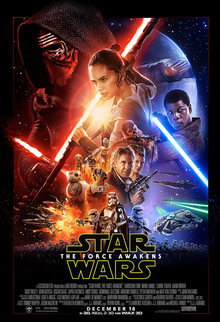 So despite the fact that Star Wars: The Force Awakens is poised to break every box-office record imaginable, gathering rave reviews from critics and viewers alike, and will likely catapult Star Wars, Disney, and a cast of faces both old and new to the highest of heights, the question still remains: is it any good? Put simply, the answer is an unequivocal yes. Almost 40 years after the series debuted, and over 10 years since its last entry, The Force Awakens is without a doubt the film that fans were screaming for. In fact, Star Wars: The Force Awakens is the single greatest work of fanfiction ever made. Taking place 30 years after Return of the Jedi, The Force Awakens presents us with a galaxy (still far, far away) that remains in chaos. The triumph of the Rebellion over the Empire was never the complete victory it seemed, and the surviving remnants of the Empire have reformed into the First Order, still opposed by the group now calling themselves the Resistance. Into this unending conflict fall a group of unsuspecting heroes, whose journey will bring them not only into the heart of events that will change the course of things to come but also across the paths of some older, more seasoned heroes, who have been through this sort of thing before. To say much more about the plot is to delve into spoiler territory, but it’s a well-balanced mix of old and new, with enough twists along the way to keep you constantly guessing. The Force Awakens revolves around newcomers Rey and Finn, a move that gives the film an energy that helps it feel unique and to stand out from what came before. Rey, a scrappy scavenger on the desert world of Jakku, is resourceful and highly skilled, but with a sense of compassion that sets her apart from her cutthroat surroundings. Finn, on the other hand, is a stormtrooper with a conscience, who is willing to throw aside the only life he’s known due to his distaste with the First Order’s methods. This unlikely pair form the heart of the film, and they’re unlike anything we’ve seen before in Star Wars. They’re much more relatable and human than characters we’ve seen before, not intended to fill archetypal roles in the story but to give it emotional resonance. And luckily the filmmakers cast a brilliant pair of (relative) unknowns, Daisy Ridley and John Boyega, in the roles. Boyega brings fire and drive to the film, but it’s Ridley who steals the show, turning in one of the most natural and authentic performances we’ve seen in a Star Wars film. In many ways, her portrayal of Rey echoes Mark Hamill’s from the original trilogy, not because their characters are in any way parallel (remember no spoilers) but instead for the level of believability she brings to the role. Daisy Ridley is Rey, much as Hamill was Luke Skywalker. Of course, Rey and Finn are joined by a host of familiar faces, all of whom have aged a bit since we last saw them. Harrison Ford’s Han Solo, with Peter Mayhew’s Chewie by his side, is given the biggest role of the old-timers, and he’s just as fun to watch as he ever was. The wisecracking, improvisational side of Han still shines, but it’s been tinged with a weariness that suits the character, and reflects some added emotional depth we haven’t seen before. Carrie Fisher’s Leia shares that weariness, and it’s clear these characters have lived through a lot in the last 30 years, but she’s still always more than a match for Han. It’s really a delight to see this pair reunited again, and inhabiting these beloved characters so perfectly. These may be roles they left behind long ago, but they still fit the actors like gloves. They’re not the only familiar faces, though, as Anthony Daniels’ C-3PO returns along with R2-D2 and others. And, of course, there’s Mark Hamill’s Luke Skywalker, about whom I will say absolutely nothing. The Force Awakens is actually stuffed with new characters. There’s Oscar Issac’s Poe Dameron, a cocky hotshot pilot for the Resistance. Of course there’s the villainous Kylo Ren, played by Adam Driver, whose mask and red lightsaber call to mind the intimidating form of Darth Vader, in whose footsteps he hopes to follow. But that’s not all. Familiar names like Lupita Nyong’o, Andy Serkis, Max Von Sydow, Domhnall Gleeson, and Gwendoline Christie all have new roles to play, some more secret than others, along with seemingly the entire cast of J.J. Abrams’ Lost. And therein lies one of The Force Awakens‘ few flaws. It’s literally stuffed with characters, old and new, to the point where some seemingly important characters fail to make the impact they were perhaps designed to. There’s a lot going on in The Force Awakens, and there’s not always enough screen time to go around. Speaking of J.J. Abrams, who directed the film as well as writing it with Empire Strikes Back and Return of the Jedi screenwriter Lawrence Kasdan, it’s clear from the start that he’s a huge Star Wars fan. From the broad strokes to the small touches, Abrams goes out of his way to make the film feel like it belongs in the series. Little things like the scene wipes favored by George Lucas return, while the production design and the focus on practical effects wherever possible help it feel right at home alongside the original trilogy. Of course, having John Williams return to bring his iconic music back to life once again is a key piece of the equation. But Abrams brings a lot of new aspects to the film as well. In many ways it feels more modern, both visually and in the script. Space battles are shakier, dirtier, and more chaotic than ever before, while the Millennium Falcon swoops and twists in ways we’ve never seen. The action has a kinetic quality that feels at home in modern cinema, and at times a long way from the model-driven effects of the original trilogy. From a storytelling standpoint, the film is often extremely funny, whether from the quirky mannerisms of BB-8 or a well-timed offhand comment. In fact, The Force Awakens is the most jokey film in the series, with many of its laughs feeling more like jokes than simply humorous beats in the story, something of a departure for the series. Overall, the movie’s rhythm feels very different from the somewhat formal, classical style of the previous six episodes, much looser and freer in a way that feels in sync with the current state of filmmaking. But there is one aspect of The Force Awakens that doesn’t sit well with me, and it’s one I’ve discussed before. I called the film fanfiction earlier, and I chose that word intentionally because that’s essentially what we’re dealing with. George Lucas, the creator of this the most beloved film series of all time, has been reduced to a “based on characters created by” credit in the film. When Disney bought Lucasfilm, he handed them his story notes and outlines for his vision of Episodes VII-IX, which they discarded in favor of what we have today. That’s, of course, entirely their right, and the resulting film is genuinely great, but the fact remains that what we’re seeing is not in any way the story originally envisioned by the saga’s creator. It’s hard to blame them, following the unprecedented reaction to the prequel trilogy (which, full disclosure, I absolutely love), and it’s very clear that The Force Awakens was crafted first and foremost to please the fans. That’s going to make most people very happy, but it honestly leaves a bit of a sour taste in my mouth and makes the film feel somewhat inconsequential. I know many have rejoiced that Star Wars was taken away from Lucas, but that’s something I just can’t do. And I can’t help but wonder what the “real” story is of what happened after Return of the Jedi. At this point we may never know, and most people probably won’t care, and I’m not saying they should. But I couldn’t honestly review the film without touching on this aspect of my reaction to it. Objectively, however, Star Wars: The Force Awakens is a hell of a good ride. It’s fun, it’s exciting, it’s funny, and it has a lot of heart. In Rey and Finn the film has created two of the most compelling and interesting characters in the history of the series, and I honestly can’t wait to see where the story goes from here. This is, of course, just Episode VII after all, with at least two more main entries plus several spin-offs still to come. The new era of Star Wars is just beginning, and it’s clearly in good hands. But for now we should take the time to savor The Force Awakens. After spending much of my youth as the local Star Wars nerd, sneered at for my devotion to the franchise, it’s nothing short of miraculous to see the way the public has embraced the series with open arms once again. This is a big moment for Star Wars, and I hope it lasts as long as it can. It’s a universe of unlimited potential, and we’re still only just scratching the surface. This entry was posted in Movie Reviews and tagged Movie Reviews, Star Wars, Star Wars: The Force Awakens, tfa, The Force Awakens by lovepirate77. Bookmark the permalink. OK, I understand your point about The Force Awakens *not* being Lucas’ vision, and with that in mind, whatever follows after episode VI will not be a “true” Star Wars movie. However, if we didn’t know of those story notes (I heard about them in the eighties, then after episode III they never existed and then suddenly they did, anyway?) is there anything in this movie that doesn’t really feel like a continuation of the story from the original trilogy? Does it mesh with the original trilogy? Sure. But so do millions of fanfics out there. Without Lucas being involved, what we got was “a” Star Wars sequel, not “the” Star Wars sequel. It’s a distinction that probably matters to no one but me, but I feel like it’s important. I’m actually working on a spoiler filled article/analysis with my further thoughts (positive and negative) on the film, so hopefully that will post tonight. Would really like to see that article! And there were a handful of stylistic things that I felt didn’t fit particularly well with the previous films, but they weren’t major. I get your feelings too. There were some things that didn’t feel like it meshed well with the rest of the series, mostly on the dialogue. That probably has to do with the fact that it can never truly be a Star Wars sequel. On the other hand, it was probably one of the most fun times I’ve had at a theatre in a while. This is also probably one of the few times in an updated story when I was just as interested in the new characters as I was the old, which I consider a great feat. The single greatest work of fanfiction may have some negative connotation in it, but I think it also speaks into the fact that this film had the hardest trek upward of probably any film and still somehow succeeds. That’s probably the most important thing about this movie. I loved the film and can’t wait to explore more of the universe in the next film. In a weird way, I think that actually speaks to the Star Wars films themselves. They aren’t the most perfect constructions of stories considering their major coincidences and character depths, but the spectacle and raw heroic emotion behind it far, far, FAR outweighs the negatives. This film continues that tradition to the production scale in the case of being made with a new generation with different voices under a sequel status but still being a fantastic movie anyway. I want to see this series continue, and I’m glad that the universe can continue. It was definitely a lot of fun, and I loved that they were able to make me care about Finn and Rey as much as Han and Leia, but you’re right about some of the dialogue feeling off. It definitely had a tough trek to the screen, and it’s really impressive that it turned out so good. I’m actually more excited going forward in the Star Wars universe than I was for The Force Awakens. I love that the films are almost pure heart, and I’m glad it’s already such a big success, even if I might not think it’s perfect. Thanks! I’m really surprised at how much I liked the new characters, but they were the perfect combination of great acting, writing, and directing. I’m eager to see more of them, especially Rey and Finn. I hadn’t consciously noticed that, but yeah. I have a tendency to want the “authentic” version of the story, the “real” story. The reality of stories is that, once they are told, they are glommed onto by every reader/viewer/hearer of the tale and related to each reader’s own life. Stories are changed by reading/’viewing/hearing. Stories shapeshift. There is no “authentic” version of any tale, there is only whether it moves you or not, whether it reveals some deep truth. Now, is this the sequel George Lucas would have made? Is this the “real story”? It is as logical a continuation of the Star Wars universe as any good fanfic. Look at Marvel again, with it’s continual rebooting and retelling of the same origins and characters’ histories. Perhaps a good tale doesn’t need to be carved in carbonite. Good stories shapeshift over time, space, and shifting culture. Good stories are eternal, the characters immortal. Perhaps there is no One True Ending, or Canon. You see, I would rather consider episode I – III non canon. I know we’ve discussed this before and we are never going agree but this films far more like a Star Wars film than any of those did. This is a fun ride in a way none of the prequels consistently were and it isn’t trying to create a pointless political context. I’m guessing if they rejected Lucas’ story idea it was because it was too complicated again. As Lucas has described the series recently, he called it a soap opera in space, saying that Disney wasn’t interested in making that, so I guess his vision would have felt “boring” compared The Force Awakens. They went with something more commercial and obviously it’s worked out for them. As for the prequels, what I like about them is how different they feel from the original trilogy. Times change, and the “tragedy of Anakin Skywalker”, as Lucas has described the saga in the commentaries of the films, was bound to have a beginning that felt very different than the ending. Much like Harry Potter 1 feels very different from Harry Potter 7. Movies like Bond, Bourne, Star Trek, and Indiana Jones need to feel alike because they’re essentially just telling the next adventure, but viewing Star Wars as one long story makes it clear that any act 1 of a story is always different than act 2. Having said all of that, I know I’m not going to change your mind, nor do I want to. I completely respect your opinion, one obviously shared by the majority of fans. I know I’m fighting a losing battle. Sorry, I forgot to say: this is another great review. Aww, thanks! 🙂 It’s very nice of you to go out of your way to say that. We nerds need to stick together. There’s some great discussion on your Star Wars posts, both from you and the commenters. So, I had a free movie ticket and since I finally saw Episode III 1-2 weeks ago, I decided to treat myself to seeing this one in the cinemas. And yeah, I really liked it! Out of the 7 films, it’s either my 3rd or 4th fave (haven’t made up my mind yet), but I thought they really did a good job with this. Rey and Finn are pretty good characters and acted well although I feel Rey kinda fell in love with/loved Finn a bit too quickly and out of the blue to me, but that’s just me. The effects and cinematography were nice! The score was noticeable! The editing swipes made you feel like it was one of the Star Wars films! Heck, I’m not even a Star Wars lover and I almost started clapping with joy when Han Solo entered upon the screen. I really loved Kylo Ren…when he had his mask on. Once he took it off, I wasn’t too fond of the character and his delivery, but when he had it on, he was fearsome and reactionary. I liken him to a young youth who’s seduced/brainwashed by an organization akin to ISIS or the Nazi Party and is immersed into this organization while he himself is battling with his inner feelings about the organization and his parents are trying hard to make him see sense and guide him back. I’m glad I went to see it in the cinemas as it did look good on the screen. There were about 5 other people in there with me. Three of them were senior citizens and I think we all had a good time. I’m so glad you enjoyed it and have now seen all of them! I don’t know that I’d go as far as Rey actually being in love with Finn, though she obviously cares about him. They really did a great job of making it feel like it fit with the rest of the films. I still can’t stand Kylo Ren, though. With the mask or without it. Hehehe, I’m glad you had fun with the senior citizens! Yeah, Rey definitely loves Finn, but I’m not sure yet if it’s romantic or as a friend or what, I just felt the “connection” between them both came sort of quickly. I could see that. But given that neither one has had any sort of personal connection with anyone most of their lives, I took the speed of their relationship as a testament to how lonely they were. That and the adrenaline of escaping from the first order.